Making a classic white sauce is actually quite easy once you have learnt the basic technique. A classic white sauce is the basis for a number of meals and accompaniments, so it really is worth learning how to make it. A white sauce can be used as the base for a chicken pie filling, a béchamel sauce for a lasagne, as a sauce for fish (you can add parsley, a little garlic, or some roasted shallots to make it more exciting) and many more kitchen classics. Too many people think that a white sauce is pretty tasteless, but it can be really delicious if you get some subtle flavours into the sauce that can really compliment the rest of your dish. Start by putting a heavy based saucepan onto a low heat. Add in some decent, salted butter – about two ounces per half pint of sauce required – and allow it to gently melt without foaming or burning. Next, add in to the butter a couple of rounded tablespoons of flour – make sure it is lump free as this will help the finished sauce be smooth and unctuous. 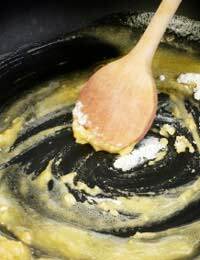 Stir the flour into the melted butter using a wooden spoon, you may prefer to take the saucepan off the heat for a moment or two to make sure it is not too hot. You are basically cooking out the raw flour taste. If you wish to add some extra flavour to the sauce – a little mustard powder is good – put it in now. Now you want to slowly add in some warm or cold milk – full fat milk gives a creamy flavour, although you get perfectly good results with semi-skimmed for less calories. Just add a few drops at a time and make sure it is incorporated fully before you add any more. You can simply use plain milk, but you can also infuse the milk (heat it gently in a saucepan) with a couple of bay leaves, a clove studded onion or even use the fish poaching milk if you are using the white sauce to cook a fish pie. Each time you add in the milk, stir it forcefully with a wooden spoon – it is this stage of the process that gives you a creamy, lump free classic white sauce, so don’t rush and put all the milk in at once. Keep adding and stirring the milk until it is all incorporated into the butter and flour mixture (called a roux in classic cooking terms). Add some sea salt and freshly ground black pepper at this point, although use white pepper if you don’t want any flecks in your finished sauce. If you keep stirring the sauce over a low heat it will thicken, so stop when you have your desired consistency. If you are planning to turn your classic white sauce into a cheese sauce, now is the time to add your grated cheese, so you may wish to leave it a little runnier.